Peach season came and went and I really went crazy with it! I adore peaches to the point of obsession. Their sweet sunny scent, soft skin, and juicy flesh have my heart. Here in West Michigan peach season extends from early July until mid September. I remember peeling peaches last summer and their sweetness stayed with us all winter thanks to my love of canning. This summer was no different, I wanted to savor peaches all winter so I bought a couple bushels worth at the farmers market just for canning. 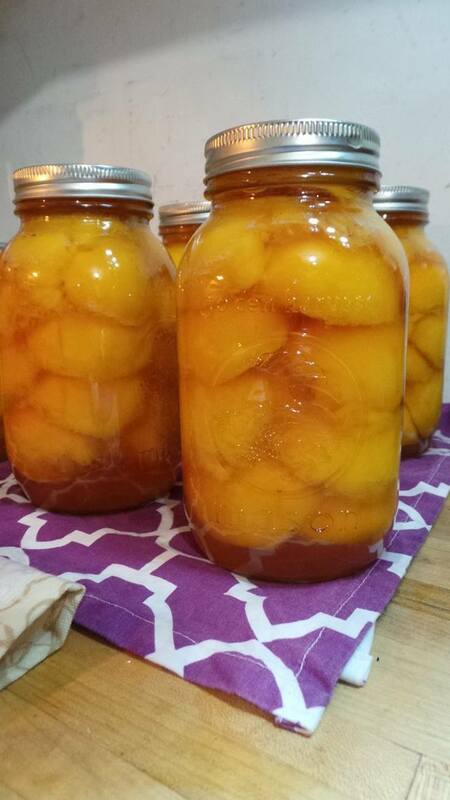 Canning peaches is easier than one might think. I get really anxious whenever I have a big canning project but once I got started it was a breeze. I got some water boiling and plunked several whole peaches at a time into that for 30 seconds and then transferred to ice water. After a few seconds the peels slid right off. I was careful to save the scraps to make jelly with later but that recipe won't be covered in this post. After peeling I sliced each peach down the center and plucked the pit out then tossed the halves into lemon water. The lemon water keeps the peaches bright with no browning. 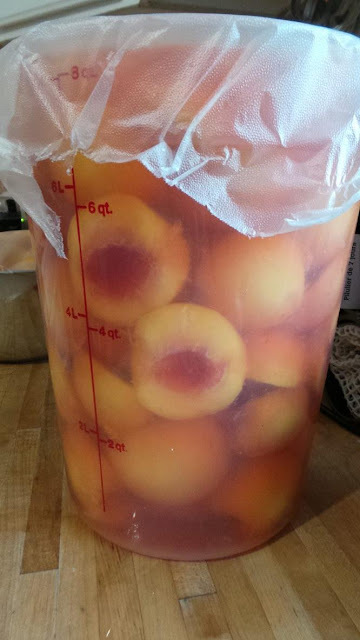 Once I had all my peaches peeled, sliced, and soaking I then transferred them into a huge electric roaster that I had my honey liquid in preheated in for hot packing. This was filled with 9 cups water and 1 very generous cup of honey and I heated the peach halves in the liquid just to a boil before packing my jars full. You can use more or less honey depending on the sweetness you are after. 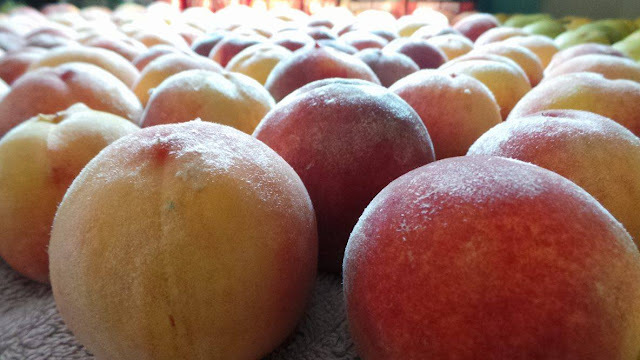 You may actually can peaches in just water if you like but we prefer a little hint of sweet honey in ours. I used L.R. 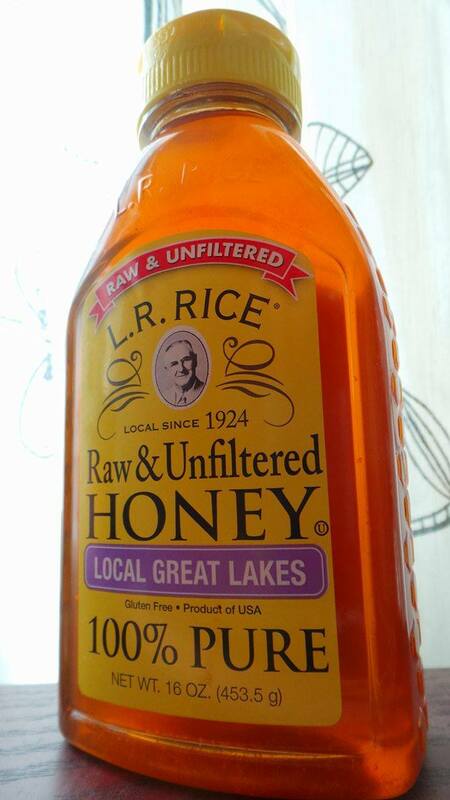 Rice Raw & Unfiltered Honey from our Great Lakes region, find retailers here. The honey is so delicious, so rich and flavorful with a beautiful amber color. In a couple of jars I added a teaspoon of ceylon cinnamon, just to try it out because I'd never used cinnamon before with my peaches. The recipe I used as my guideline is approved and safe by the National Center for Home Preservation: Canning Halved or Sliced Peaches Be sure to reference the charts on NCFHP to get times for your altitude plus more instruction. Having a canning buddy makes things go much more quickly, have fun! My peaches turned out perfect! To be sure there was no liquid loss I turned the burner off after my process time was done. I then waited 10 minutes and then set the jars in a draft free area on a warm towel. The next day I took of my rings to check seal and wipe around them in case of any stickiness. Now my beautiful peaches sit in my basement ready and waiting. We have already eaten one jar and they were phenomenal. The kids all want to drink the leftover honey syrup and that is totally fine because that is premium 100% pure honey in there! I'm so glad I discovered L.R. Rice honey, I hope you give it a try sometime. You will never want to go back to store bought canned peaches once you have tried these.